Description: This is a nice stamp made by the River City Rubber Works Company. Invitation, #1385-N. This is a nice stamp for all the invitations you may be making. It has all the "W" words like What, Where, When, & Why.!! Terrific!! Description: This is a nice stamp made by the River City Rubber Works Company. You're Invited, #1326-H. This is a nice stamp for all the invitations you may be making. It reads "You're Invited" and would be just great on the outside of an envelope or on the front of a card!! Size: 2 1/2" x 3/4"
Description: This is a nice stamp made by the River City Rubber Works Company. Baby Shower, #0967-E. This is a perfect stamp to tell everyone that you are having a baby!! Reads "You're invited to a baby shower"
Description: This is a nice stamp made by the River City Rubber Works Company. Baby Announcement, #0928-L. This is a perfect stamp to tell everyone that you are having a baby!! Has places to put the Name, Birthday, Time, Weight, Length and Parents!! Size: 3" x 2 3/4"
Description: Hero Arts makes this stamp that invites you to "Come To A Party". Invite everyone with a wonderful hand made invitation!! Description: This stamp is made by Hero Arts. A great idea for invitations and surprise dates!! Stamp reads: Save The Date. Description: This is a wonderful way to invite people to a Birthday party for your son daughter or even yourself!! Come To A Party is the title and it has places to write what the party is For, the Date, Time, Place and the RSVP number. Oh and don't forget Winnie the Pooh, Tigger and Piglet carrying gifts on top! This Disney stamp is made by All Night Media. Description: This is a nice Invitation stamp made by Hero Arts. You can use this to invite friends over for a party. Stamp has places to write in: For. On, At and By. Simple to use, just add ink! Size: 2 7/8" x 4"
Description: This is a large stamp by Creative Images. 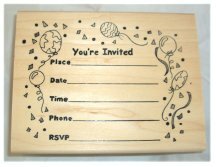 It is a party invitation stamp saying "You're Invited" and space to put "Place", "Date", "Time", "Phone" number and "RSVP". Confetti, ribbons and baloons surround this stamp. Great size for post card sized invitations! Size: 5" X 3 3/4", Image size is 4 1/2" X 3 1/2"
Description: This set is from All Night Media Disney collection and is fantastic! 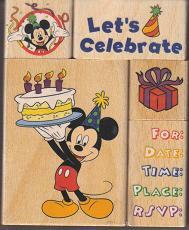 Everything you need to create your own party inventations with a Mickey Mouse theme. Five stamps in total for a great price! Size: Largest stamped image is 2 1/2" X 3 1/2"
Description: This stamp is from Inkadinkado. Perfect for invitations or to announce a special occasion! Size: Image size is 2" X 1 3/4"
Description: This stamp is made by River City Rubber Works. A great idea for invitations and surprise dates!! Stamp reads: Save The Date! Size: Image size 2 3/4" x 5/8"